Born and raised in the Boston area, Philip F. Lawler attended Harvard College, graduating with honors in Government in 1972. He did graduate work in political philosophy at the University of Chicago before entering a career in journalism. Phil Lawler has been active in politics as well as journalism. He has been Director of Studies for the Heritage Foundation (a conservative think-tank based in Washington), a member of two presidential inaugural committees; and a candidate for the US Senate. As a journalist, Phil has acted as editor of Crisis magazine. In 1986 he became the first layman to edit The Pilot, the Boston archdiocesan newspaper. From 1993 through 2005, Phil Lawler was the editor of Catholic World Report, an international monthly news magazine. And in 1996, recognizing the power of the internet, he founded Catholic World News: the first online Catholic news service. Phil Lawler is the author of six books on political and religious topics. His latest, The Faithful Departed, chronicles the collapse of Boston’s vibrant Catholic culture. (The book is reviewed here.) His essays, book reviews, and editorial columns have appeared in over 100 newspapers around the United States and abroad, including the Wall Street Journal, Los Angeles Times, Washington Post, and Boston Globe. 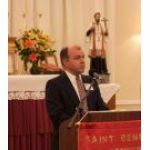 Currently the editor of Catholic World News, Phil lives in central Massachusetts with his wife Leila and their seven children.